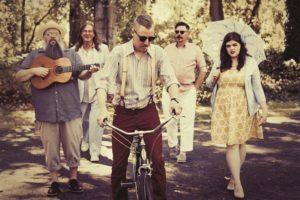 The Pearls are a fiery, nostalgic blend of original roots-rock, Americana, and Western swing, with a generous helping of sweet California harmonies. They hail from Vancouver, WA, and just released their debut album of all-original music, entitled “The Pearls”. The band has honed their punchy and rollicking live show during a slew of shows in towns large and small throughout NoCal, Oregon and Washington. They bring a good time, and a bit o’ whiskey, to every gig. The band is: Patrick Tetreault on acoustic guitar and vocals, Wayne “Buck” Ryan on bass and vocals, Nick O’Donnell on electric guitar, banjo and vocals, Robin Suskind on pedal steel, Nikolette Divine on vocals, and Sean Savageau on drums.